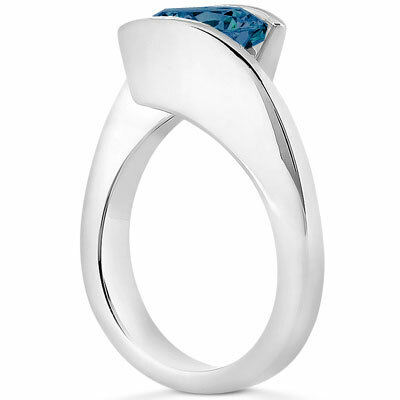 A richly-colored gem gets a modern foundation in this tension set London blue topaz ring in 14K white gold. A round London blue topaz, the deepest variety of blue topaz, is the centerpiece of this contemporary style; this 6.5mm stone is embraced by a modern tension setting that emerges in graceful fashion from the shining 14k white gold band. This is a simple style with big impact, as it perfectly combines deep, saturated sparkle with cool shine and chic curves. Glamorous and modern, this tension set 6.5mm london blue topaz is sure to turn heads. We guarantee our Tension Set London Blue Topaz Ring to be high quality, authentic jewelry, as described above.